Okay, the cover is a bad cliché. But, you know … don’t judge a book by its cover. I have an on-again, off-again relationship with a book club here in Shanghai that’s loosely formed around some of the Johns Hopkins alumni in the city. I’ll go for a meeting or two, then skip several in a row because I’m busy or out of the country or don’t feel like reading the work of political theory that everyone else voted for. 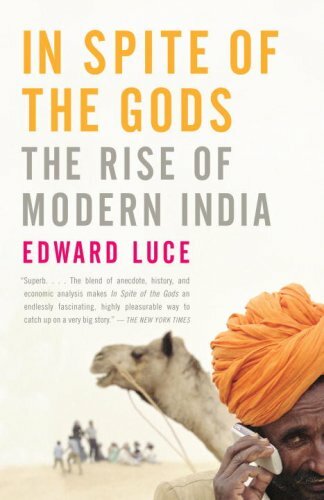 But I made it to yesterday’s session because the group had selected a book that’s long been lingering in the middle of my to-read list: In Spite of the Gods: The Rise of Modern India, by former Financial Times South Asia bureau chief Edward Luce. In Spite of the Gods is a broad book; Luce covers lots of ground, both thematically and geographically. He travels the length and width of the country to interview people who can comment on the big topics he’s investigating: the economy, politics, history, corruption, the judicial system, society, religion, and international relations. Luce devotes one chapter to each topic, which helps keep things compartmentalized and manageable, but each of these themes can (and have been) the subjects of full-length books in themselves. In Spite of the Gods is an introduction to India, not a comprehensive monograph on the country—and it sports a 2007 publication date, meaning that some of its statistics and predictions have become somewhat dated by now. But the big questions that Luce is grappling with remain as relevant now as they were at the time of writing: Where is India going and how will it get there? Will it blossom or implode? How can vibrant democracy and endemic corruption coexist? What is the role that religion, caste, and regional identity play in twenty-first-century India? How can the country achieve economic development that benefits the greatest number of people? What should India’s relationship with its neighbors—and the United States—look like? Luce is a good storyteller who occasionally lets his narrative get bogged down under the weight of too many statistics, and it took a lot for me to slog through some of the book’s middle chapters. Statistics are certainly one way to demonstrate how India is changing—or not—but I’m always more interested in the stories of people’s lives, and In Spite of the Gods has fewer of those. It’s probably a good first book to read about India, to get a sense of the big picture and the historical background (Luce’s chapter on the Nehru-Gandhi dynasty is particularly good, I think, not that this is my area of specialty), before moving on to books that are more driven by personal narratives, such as Katherine Boo’s Behind the Beautiful Forevers or Aman Sethi’s A Free Man (both of which are very good, in my non-expert opinion). Going around the circle at our book club meeting yesterday, the other members and I mostly agreed that In Spite of the Gods was a good choice for a group of people who know much more about China than India. A couple of the discussants said that they had hoped for a more academic tome—something that would, for example, discuss Indian democracy and corruption within a theoretical framework. But as I’ve said, political theory’s not my thing. Give me a good clear overview by a world-weary journalist with a sense of humor and I’m happy. That’s exactly what Edward Luce delivers.